June 1, 2011  Massey Energy, which operated the West Virginia mine where 29 men died last year, is being absorbed by Alpha Natural Resources. May 31, 2011  While the mining company says the allegation is "at best frivolous," the court documents filed by some institutional investors claim Alpha Natural Resources' takeover of the company would shield Massey executives from liability. May 31, 2011  NPR and The Charleston Gazette asked for materials to be made public. The justices opened up the initial injunction request and the response to it filed by some Massey executives. Massey operated the West Virginia mine where 29 men died last year. 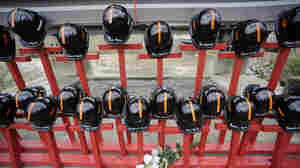 May 27, 2011  Massey operated the West Virginia mine where 29 men died in an April 2010 explosion. "The filings in this case likely will shed new light on Massey's acts and or omissions in relation to this tragedy," the NPR-Gazette motion argues. May 25, 2011  Documents unsealed in a lawsuit seeking to block Massey Energy's sale to Alpha Natural Resources reveal deep concerns about Massey's safety record, reputation and leadership — not from critics — but from two Massey board members and from Alpha. May 10, 2011  They offer a rare peak into the mostly secretive, year-long probe by state and federal investigators into the April 2010 explosion that killed 29 coal miners in West Virginia. 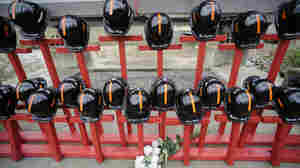 April 20, 2011  The families of the 29 miners killed in last year's Upper Big Branch explosion now have until June 1 to accept $3 million settlement offers from Massey Energy. April 6, 2011  One year after 29 coal miners died in a massive explosion at the Upper Big Branch mine, state and federal officials vowed to never let such disasters happen again. March 31, 2011  Though it had found problems, the federal Mine Safety and Health Administration(MSHA) failed to apply one of its toughest enforcement tools to the Upper Big Branch coal mine in West Virginia before a deadly explosion there last year. March 22, 2011  The new two-count criminal "information" just filed by the U.S. Attorney in Charleston, W.Va., does not directly involve the April 5 blast at Massey Energy's Upper Big Branch mine. A former foreman is accused of making false claims. January 5, 2011  Federal officials contend that Massey Energy has repeatedly and persistently violated safety standards at the mine. Massey says the mine is safe, but it has already shut down coal production and is in the process of closing the mine for good. December 23, 2010  "The Secretary [of labor] can come to court to eliminate the 'continuing hazard' without trudging through a series of administrative procedures," judge rules. December 7, 2010  Massey Energy CEO Don Blankenship's retirement agreement includes $12 million in cash, a truck and quite a few more considerations for his service to the mining company.